In Mineral County, close relatives may purchase birth, death, and marriage records (from 1917 on), usually for $12, from the Vital Registration Office. For vital records before 1917, ask the County Clerk. Ordinarily, birth records are considered public after 100 years, death, marriage, and divorce records after 50 years. Named for its abundant minerals, the county was created in 1866 from Hampshire County. 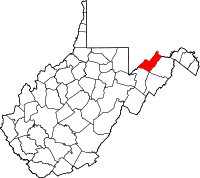 Abraham Lincoln's mother, Nancy Hanks, was born near modern Keyser, the county seat. Because it was a key supply point, Keyser repeatedly changed hands during the Civil War. The town was named for William Keyser, the railroad's vice president, and incorporated in 1874.